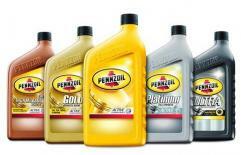 Energy Petroleum Company is proud to distribute Pennzoil, America’s #1 passenger car motor oil brand. Specially formulated with Hyper Cleansing Technology™ which means nothing keeps your engine closer to factory clean*. Pennzoil Ultra™ is the highest level of clean your engine can get. It's the new standard in synthetic motor oils by Pennzoil, because nothing keeps your engine closer to factory clean* than new Pennzoil Ultra™. Pennzoil Platinum® is an advanced full synthetic motor oil. Formulated with Superior Active Cleansing Agents, it continuously attacks potential and stubborn deposits to help keep vital engine parts clean. In fact, Pennzoil Platinum® keeps your engine up to 40% cleaner than current industry standards, maximizing engine protection and responsiveness. Pennzoil® Gold™ is a synthetic blend motor oil with a combination of high-quality conventional and synthetic base oils and additives to provide better protection for severe driving conditions (stop-and-go driving, frequent short trips, extreme temperatures, idling and towing). The Dexos specification holds motor oils to the same stringent requirements as GM's most advanced engine technology. GM dexos1™ testing contains specific proprietary tests that are not included in current industry standards. Meaning, GM dexos1™ approved oils exceed the performance of today's conventional oil. Pennzoil® High Mileage Vehicle® is a conventional motor oil, specifically designed for new or late model vehicles with over 75,000 miles. Enhanced with a unique combination of special conditioning agents and additives to help stop leaks and reduce the oil consumption that is typical of older, worn engines. Pennzoil® Conventional motor oil is a traditional oil base, fortified with Active Cleansing Agents™ to continuously prevent dirt and contaminants from turning into performance-robbing deposits, helping to keep your engine clean and responsive. In fact, Pennzoil® motor oil cleans out up to 40% of sludge in the first oil change and keeps cleaning all the way to your next oil change.